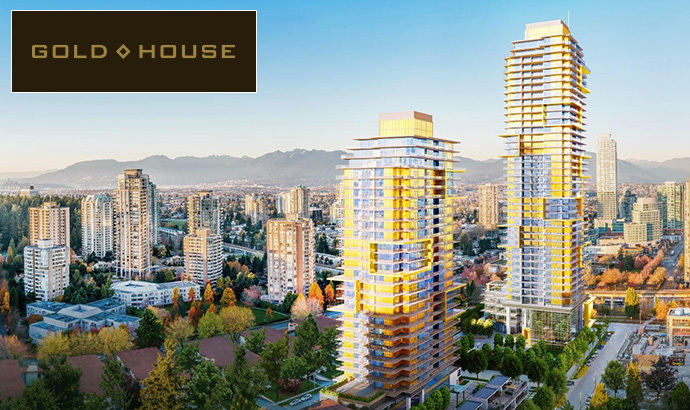 The pinnacle of urban living is now here at the presale Burnaby Gold House condo project by Rize Alliance. High style comes to Metrotown! The world’s number one design firm, Metro Vancouver’s most progressive developer and the gold standard in living is now here at the Metrotown Burnaby Gold House condos that bring thought design and unique style to this unbelievable location. 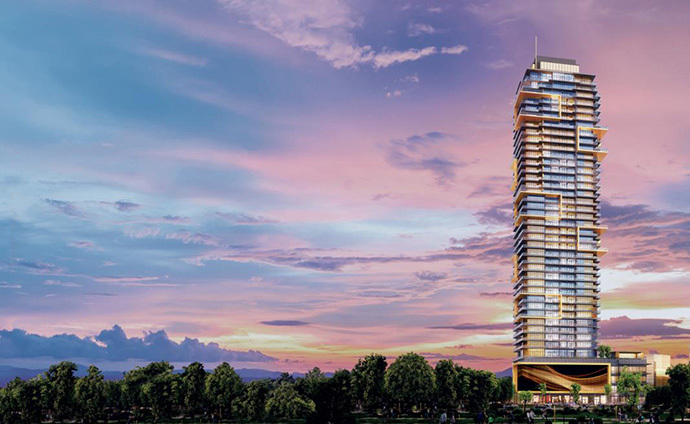 Tower suites at the Goldhouse Burnaby condo tower are now 90% sold out! But the Gold House Penthouse View Collection suites are now available (with ceiling heights around 10’8” and expansive outdoor patio decks!) Live in a work of art. 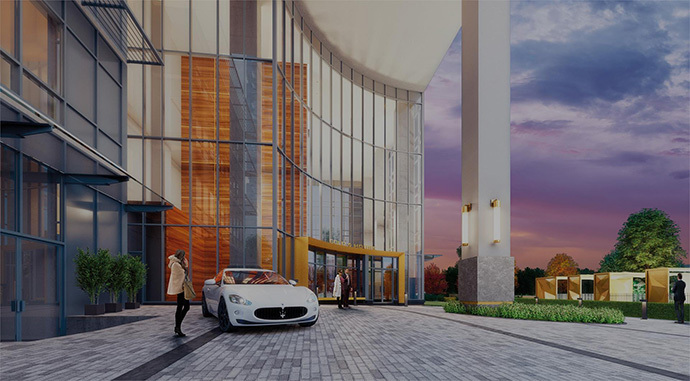 From over height ceilings to air conditioning and first class resort style amenities, the most prestigious Metrotown condo address is now yours from just the $270’s! Check out the story behind the luxury Burnaby Gold House Metrotown condos by Rize Alliance below. For additional information, please visit their marketing site at www.goldhouseliving.com today or you can simply register on this page for more details. Remember that the golden few know an opportunity when they see it! The Metrotown Gold House presentation gallery is now open at #101-4211 Kingsway Burnaby and they are open noon to 5pm daily, except Fridays. Internationally recognized and award winning HBA (Hirsch Bedner Associates) created a unique modern interior finishing palette of materials and colours just for the Gold House Metrotown condo tower. Here, home buyers will find expansive windows with airy nine foot ceiling heights (up to almost 11 feet for the Penthouse View Collection) that maximize light. Each of the Metrotown Goldhouse residences will also feature generous terraces with private views of the Metro Vancouver area. HBA designed 2 signature colour palettes called Graphite and Quartz, so presale homebuyers can take their pick depending on their style. 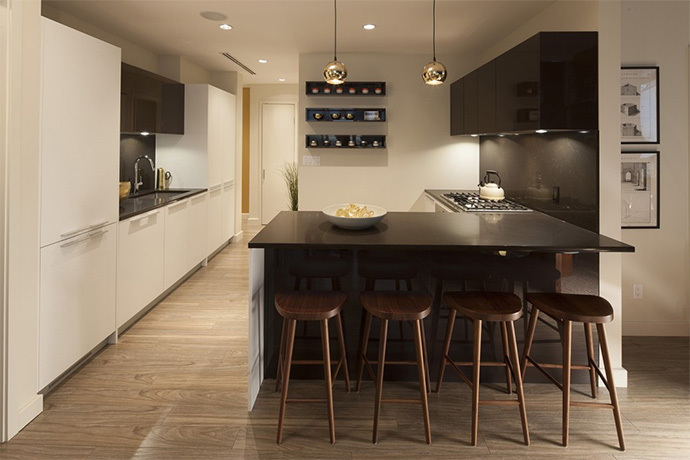 The kitchens at the Gold House Burnaby Metrotown condos will feature a Bosch appliance package and custom Italian Armony Cucine soft close cabinets. Other kitchen features include integrated LED under cabinet lighting, quartz backsplashes, stainless steel under mount sink and built in stainless steel microwave. 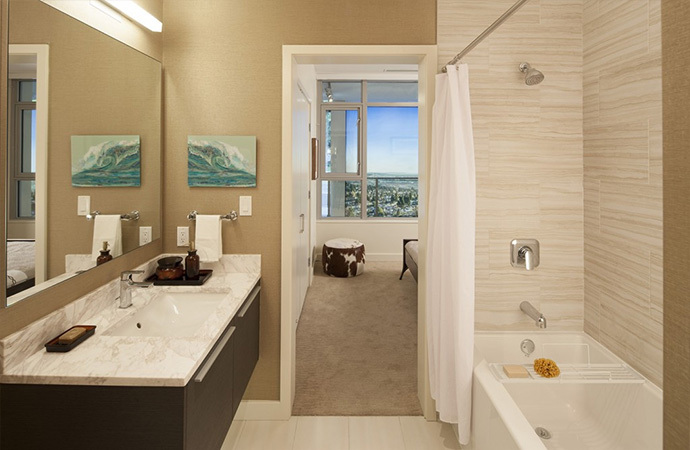 In addition, the spa inspired bathrooms will feature deep soaker tubs, polished quartz and marble counters and all homes come with in suite laundry and air conditioning! Other bathroom finishes include spa like showers with semi frameless glass doors, polished Euro inspired chrome fixtures, under mount sink and luxurious large format wall and floor tile work. The living spaces at the GoldHouse Burnaby condos feature elegant wide plank laminate floors and the bedroooms have plush carpets. Of course, the long-term value of the presale Burnaby Gold House condos is that it is concrete construction. There is fob controlled elevators, lobby, parkade and entry door access, bike and car wash bays, bike/storage lockers for each home and all new homes are backed with the Travelers Guarantee Company of Canada 2-5-10 year coverage. All GoldHouse Condos are also covered by RizeCare quality and service guarantee. Marketed as “Top-Tier Amenities” the common areas for the luxury Burnaby Gold House condos are simply unmatched in this market. 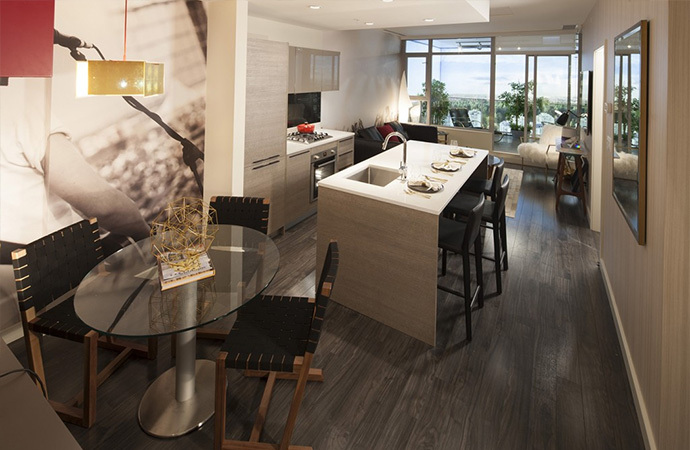 The amenity spaces are an integral part to the community and lifestyle here and they were carefully planned, thought-out, purposefully design and made for residents who expect more out of their new home. The Metrotown Burnaby Gold House condo development consists of 2 high-rise residential towers called the South and North Towers. Amenities will be split between the two, with the North Tower having more of the common amenities. The South Tower at Gold House Burnaby real estate development will feature over 11,000 square feet of best in class amenities that include a state of the art fitness centre with cardio and weight lifting equipment, a yoga studio, sound insulated study/music practise room and two expansive social rooms that are perfect for entertaining. The first floor social room in the South Tower of GoldHouse Metrotown will include a show kitchen, dining area and lounge areas while the second floor social room has a spacious lounge space and wet bar. 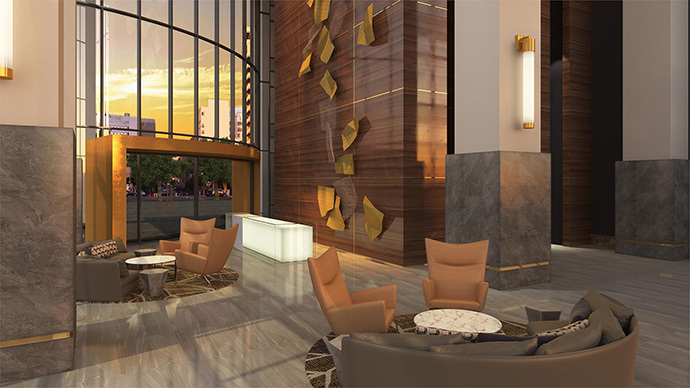 The North Tower at Gold House Living will feature over 30,000 square feet of indoor and outdoor amenity spaces as well as 4,000 square feet of furnished outdoor terrace space with views and lounge areas. The fully appointed state of the art fitness centre will have weight lifting and cardio equipment and the lounge area will be sound insulated. There’s also an expansive social room for large and small gatherings that offers a show kitchen/bar, separate warming kitchen, dining area and lounge space. 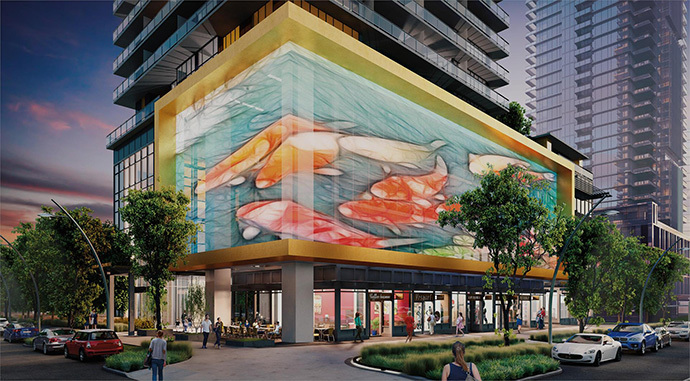 The Gold House Burnaby condos are located in the heart of Metrotown, where everything is within walking distance to this vibrant urban scene. From their web site: From international flavours to homegrown cuisine, from breakfast to your nightcap, options abound at the all-season Restaurant Row. Metropolis at Metrotown is home to fashion-forward shopping destinations like Armani Exchange, BCBG, Coach, and Banana Republic – to name a few. Nearby Crystal Mall offers an eclectic selection of retail and service amenities. Burnaby’s Central Park offers over 86 hectares of greenery and recreation space that includes an 18-hole pitch and putt golf course, tennis courts, and an outdoor swimming pool. Nearby Kingsway is the gateway to the city, where multiple transit stations provide convenient access to Downtown Vancouver and beyond.